Rise 'N Shine Farm is a certified organic produce farm in Northwest Georgia between Calhoun and Rome. It is currently taking sign ups for its Main Season CSA Program. The Main Season goes from April 22nd through November 15th for a total of 30 weeks. Visit https://risenshineorganicfarm.com/what-we-grow-and-when/ for a list of what we harvest in each season. Items from other farms are not always certified organic such as apples, grits, honey and more. 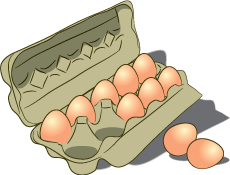 Our eggs are not certified organic but the hens are pastured and fed a non-GMO diet. Additionally our onions are not certified organic because viable organic onion seedlings are unavailable but we grow them using the same methods as our certified organic crops. Not ready to commit to being a full-time member yet or are all shares sold out? Subscribe to the Farm Stand for Rise N Shine Farm and get the chance to purchase a share each week that there is a harvest bounty.